There have been renewed calls for the Government of Cameroon to compensate exiled human rights activist and Southern Cameroons Youth League, SCYL, leader, Dr. Ebenezer Derek Mbongo Akwanga, FCFA 1.5 Billion. 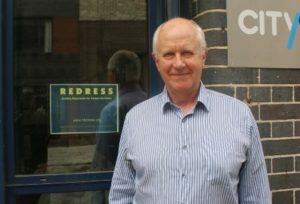 Defence Counsel for London-based Human Rights Organisation, REDRESS, Kevin Laue, has called on President Paul Biya to urgently fulfil a 2011 advisory by the United Nations Human Rights Committee to pay reparations, including compensation, for the torture and imprisonment to Akwanga, now on exile in the United States of America. Arrested in 1997 alongside dozens of other Southern Cameroons activists, Akwanga was tried and sentenced by a military tribunal to 20 years in prison for subversion and terrorism – charges they all denied. He managed to escape to Nigeria in 2003 and REDRESS helped file his case against the Government in 2007. The Cameroon Government has, so far, not respected the instructions the Human Rights Committee made after examining the matter. On behalf of The Post, Francis Ngwa Niba met Kevin Laue who was Akwanga’s Defence Counsel in Geneva, Switzerland, at the REDRESS head office in London, for an interview. Your human rights organisation, REDRESS, represented Ebenezer Akwanga in his torture case against the Government of Cameroon at the UN Human Rights Committee, UN-HRC, in Geneva. How did it come about? Dr. Akwanga approached us in 2007 and told us what happened to him, how he was arrested and tortured and tried by a military tribunal (even though he was a civilian) and sentenced to 20 years in prison. He also narrated how he managed to escape and made his way to the United States of America via Nigeria. He wanted us to help him. We were able to bring a case on his behalf to the UN-HRC in Geneva, Switzerland. We took it there because Cameroon is a signatory to an international treaty called the International Covenant on Civil and Political Rights. The country is also a signatory to the treaty which allows individuals who have had their human rights violated to bring a case to the HRC in Geneva. We spent some time getting all the necessary information and documentation from Dr. Akwanga and we were then able to file the petition in 2008. Your organisation probably receives thousands of requests from people. How do you decide which case is relevant? The first thing we usually need to know is to establish if the facts do constitute torture as defined in international law. The key thing is that torture in International law means that someone has had severe pain, physical or mental, inflicted on them by a State agent. That will mean that the Government is responsible in some way. In other words, that distinguishes it from torture by civilians on other civilians. The second thing is that we often need to check if there is anything we can do, because, some countries are not signatories to some of these international treaties. Sometimes some people, when it is explained to them that it will be a long and difficult process, decide they don’t want to go through it. Others decide that if their families, still back in the country are going to be targeted or arrested sometimes (as often happens), they will not go ahead with it. Also, there are cases when we can’t really do anything. In Akwanga’s case, we were able to pursue the case because Cameroon is a signatory to the treaty. That means it has allowed the HRC to consider all cases brought by Cameroonians to it. How do you make sure people are just not lying and want to get free money from a State? Do you hire doctors to check on the veracity of allegations? In Akwanga’s case, what was the tell-tale evidence that he had been tortured, imprisoned? It is always necessary, whenever you have to take a case either to the HRC or to a court, to produce evidence which will satisfy the body concerned that what has happened, allegedly, did happen. In Akwanga’s case, we based on evidence that he himself gave. He needed to set out very, clearly, what happened to him. Secondly, we use medical experts; physicians and psychiatrists and psychologists, who can examine people and who can reach conclusions. They can never prove that torture took place because they weren’t there, but it is possible to produce medical evidence which is consistent with the story as told by the victim or survivor and that adds credibility. After examination, he can then say these particular injuries are a result of torture or a psychiatrist will then say this person is suffering from post-traumatic stress disorder (PTSD) and that is consistent with what the person said happened to him/her. How bad was Akwanga’s case compared to other cases you have handled? All torture is bad, but sometimes people go through more than others. I think one of the worst things that Akwanga had to endure was the long period during which he was in detention and what he had to go through. He was arrested in 1997 and only managed to escape seven years later. During that whole period, he went through many awful experiences, direct torture in the several weeks and months when he was first arrested and was being forced to make confessions or admit to things he did not do. There was also indirect ill-treatment during that time; the neglect, the abuse by fellow detainees and then the trial itself, which was before a military tribunal which, in itself, is completely wrong in international law. He is a civilian; he should not have been subject to a trial by a military court. Then, there were the extremely bad conditions in prison where he spent many years. So, I will say his torture is at the extreme end of the scale. It will be among the worst that we have seen. This means the HRC has to look through all these evidence before deciding if it is necessary to look into the case? What they do is that they look at what we present – a petition (a technical term). It included all I have been saying about the case, which is the narrative. We presented supporting evidence which included medical reports and reports from Amnesty International. They looked at all the evidence. They then gave the Cameroon Government a chance to respond. So, each side is given a chance to prove its case. Eventually, the Committee makes a decision and they did so in Akwanga’s case in 2011. It is all done on documents. It is not a trial in the usual sense when people give oral evidence with witnesses. It took almost three years before a decision came out. And what was the decision? The Committee looked at both sides of the argument and it was sufficient for them to conclude that what Akwanga said was the truth. He was tortured, his trial was unfair because it was held in a military court, he was not given proper chance to defend himself and that he had been ill-treated in prison. They concluded that Cameroon has breached all its obligations. Cameroon had agreed not to torture people, not to arrest them without telling them why they were arrested, not to deprive them of legal defence, not to ill-treat them. It then issued what it calls its Views that are really recommendations that it must give Akwanga an effective remedy. It went further because it gave some specific things that Cameroon was meant to do. Cameroon had to investigate the issue of torture and it had to prosecute those who were guilty of torture in that instance. The Government also had to review the conviction itself and they had to make some reparations to Akwanga, including compensation. They didn’t mention a figure, they don’t usually do that but it had to be sufficient to remedy what had happened to him. REDRESS since made a recommendation about how much the Cameroon Government had to pay Akwanga as compensation…? These views were made more than five years ago and sent to the Cameroon Government. Cameroon has done very little, if anything. A few years ago, we wrote directly to the Government in Cameroon, to the President and other State officials in order to get some kind of dialogue going. We said we were of the view that it was reasonable to claim a figure of US 3 million Dollars (approximately FCFA 1.5 billion) and that we were quite willing to discuss this further and to try to resolve the compensation issue. Unfortunately, the Cameroon State did not reply but, eventually, a year or so later, they did file a paper with the HRC in Geneva saying that they knew that we were seeking this amount of compensation but, unless he went back to Cameroon to face the judicial process there (there is a warrant for Akwanga’s arrest in Cameroon), they were not prepared to do anything. Why do you think the Cameroon Government is reluctant to resolve the issue without Akwanga being physically in Cameroon? In our view and in Akwanga’s view, it was just showing that they were not being serious. The HRC made it very clear; they knew that he was in exile in the USA. They, in no way, suggested that this had to be dealt with by him going back to Cameroon. It is absurd for the Cameroonian Government to take this position. They know he cannot go back without being persecuted; arrested and possibly tortured again. Cameroon Government is avoiding the compensation, the investigations into the torture, they are avoiding the review. Will you say the Cameroon Government is not serious about the HRC recommendations? I will not go that far. I hope that they will still take the obligations seriously. Why sign up to international treaties if you are not going to abide by them? There have been cases of other Cameroonians taking the Government to the HRC, wining their cases and are effectively paid. They have dealt with those other cases. We are still going to pursue them to do something. It makes no sense for them to ask Akwanga to go back to Cameroon. They can interview him via video; they can send a commission to interview him if they want more evidence. We are quite happy to give more information if required. From all indications, they are treating Akwanga’s case differently. Do you think this is because he is campaigning for the independence of English-speaking Cameroon? It could be that but they haven’t said anything to that effect. In International law, that is not relevant to this case. He was tortured and deserves reparation. Five years down the line and the Cameroon Government has not honoured its international obligations. What next? It is difficult. The HRC, like other international bodies, is limited in its capacity to follow-up these cases to persuade governments to abide by their decisions. This is one of the limitations of these kinds of international treaties; the enforcement mechanism is rather weak. The Cameroon State has to be responsible if they have any concern about their reputation. Akwanga is half blind now and still suffers from nightmares. Do you think this is because of his years in prison? He has had a lot of problems health-wise in all the time that I have known him. We have seen medical and psychological reports about him. I have spoken to him a number of times when he has been very down. He is battling and will always battle to cope with what happened to him. He is, however, remarkably resilient. He has continued to try and rebuild his life, to provide for his family. He is a man of very considerable academic ability and he has gained a number of qualifications since he escaped from prison. He needs more support and if he did get some reparations that will boost him a lot. Not only financially (it is not only the money that is important here). He needs acknowledgement that what the Government did was not correct. He has only had an acknowledgement by a UN body which is something in itself that he was believed and it is on public record now that what he said happened. He is by no means fully recovered and probably never will be. If he can get a measure of justice which is what we are seeking for him, that will help a great deal as it often does for torture survivors.